Following the passing of Muin'iskw in 2011, I went through her many notes and computer files in order to capture any teachings or wisdom that might have been forever lost with her death. This was a hard time for me, personally; as her husband, I had been there for many of these teachings, and many memories were brought back for me. However, as I went through all of this, the idea was planted that this wisdom, the legacy of Muin'iskw, should be shared with as many people as possible, so I have gathered these items here. You are being given a rare glimpse into real wisdom from the Red Road - treat it gently, and use it wisely, as it is precious beyond measure. Also, as in all such wisdom, you should give proper acknowledgement when you share this wisdom with others. 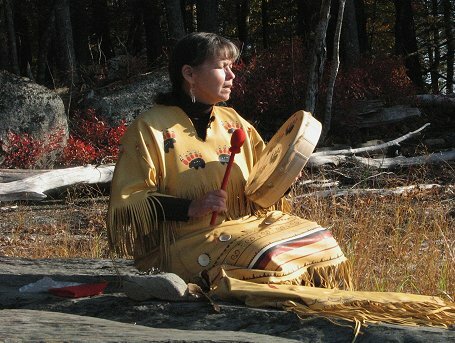 Smudging Ceremony - the script written for a smudging ceremony that was performed at Kejimkujik Park in 2003 - a good explanation of the seven directions and their significance in Mi'kmaw tradition. The Seven Districts Mawi'omi Petroglyph - interpretation of one of the most significant petroglyphs at Kejimkujik Park, as taught by Muin'iskw.